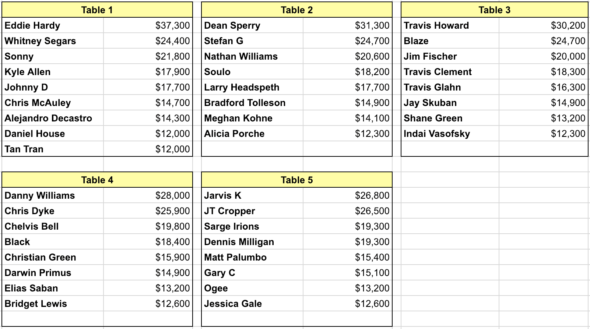 Here are the starting chip stacks and table assignments for this Saturday’s Winter Final. Seating at each table will be arranged to better distribute the chip stacks. If we don’t hear from you before 30 minutes have past since the start time, your stack will be removed from the table. Please let us know if you’ll be late or absent. And in case you forgot, the winner will receive a trip for 2 to Las Vegas (airfare and hotel) for 3 nights, or they can opt to take a $500 cash prize. All who make it to the final table (top 9) will receive a commemorative Freeroll Atlanta card protector. See you Saturday! Good luck!